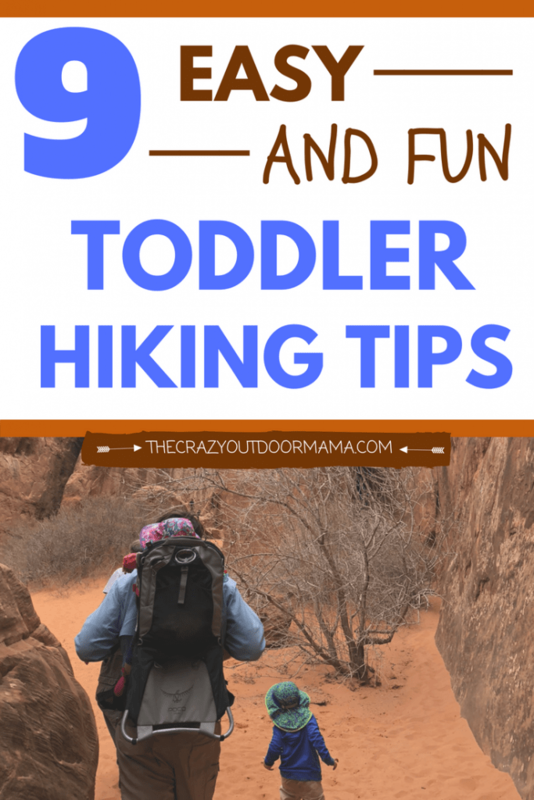 Hike with your toddler and keep EVERYONE happy with these fun tips! Play I Spy on the Trail! 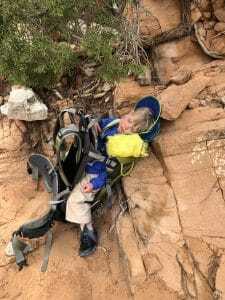 Bring three times more food and water on your hike than you think your toddler will need! When choosing a hike with a toddler, pick a fun one! When hiking with your toddler, bring a carrier for backup! Plan for breaks during your adventure! 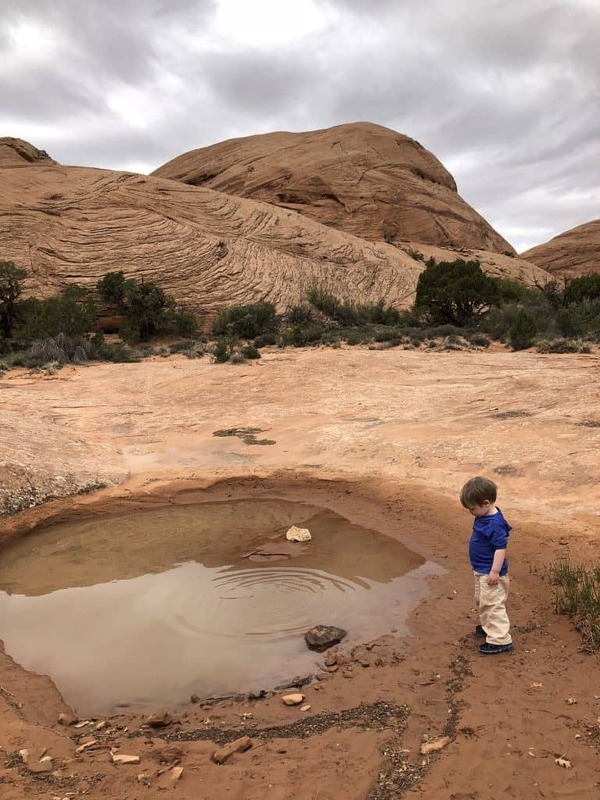 Where will you take your toddler hiking? P.S. Here are some related articles you may also enjoy! Hiking with toddlers can be incredibly rewarding for all involved; it just takes a little patience and planning! Getting outside and stretching our legs is something I try to do every day. Though it might seem like more work than it’s worth initially, it’s so worth it! There are MUCH less no’s outside, and there is always something new to look at. There are sticks to be thrown, rocks to be stacked, and new sights to be seen. 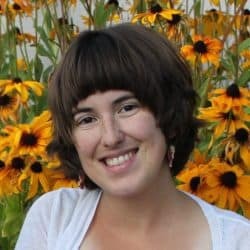 If you are planning a trip soon that includes tons of hiking, or maybe you just want to start getting out more but feel overwhelmed by the possibility of tantrums halfway through (kudos though for wanting to start) check out this list of what I’ve found works! P.S. If you’re concerned about what all to pack for a day hike, you should check out this list! It is super detailed, and it will probably remind you of some things to bring that you never even thought about! One of our bigger hikes that our toddler did wonderful on! I find that sometimes, despite the beauty around them, toddlers just get plain old bored when hiking! I love to make a game to keep their attention, and what better hiking game than one that encourages them to look around! You can think of items on the spot, or bring a list ahead of time. I’ve had really good success with making a little sheet with cute pictures of things for him to find. This is especially helpful if you are going on a walk around the neighborhood; make the ordinary fun and interesting! I always include some easy stuff, like certain shapes or colors of rocks, as well as a little more difficult ones, such as feathers or certain color flowers. It gives him a goal, keeps him excited, and encourages him to keep walking! 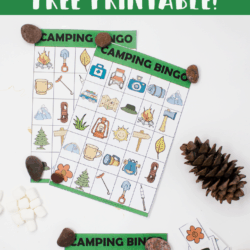 One of the scavenger hunt sheets I made to keep my toddler engaged while hiking! 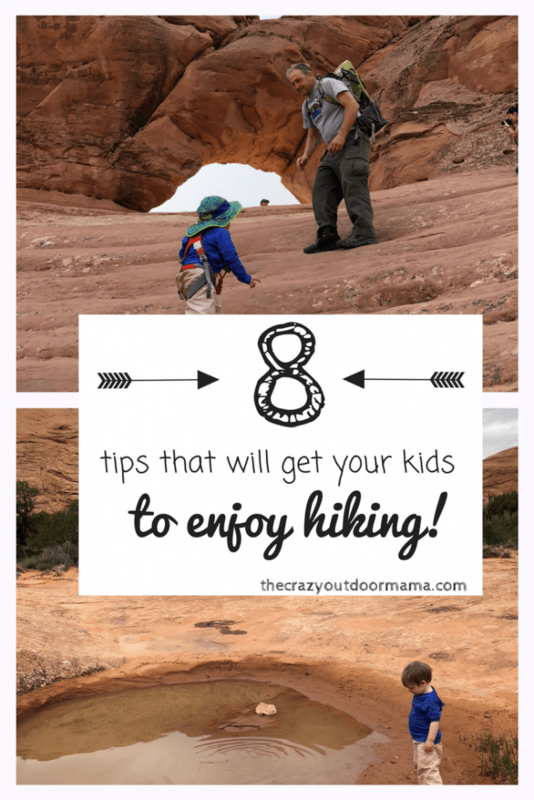 We went on some amazing hikes while visiting Arches National Park! We were super grateful that grandpa came along to help wrangle the three kiddos. He was most helpful though with our toddler! He would run ahead enough on the trail to be out of sight to “hide”, which would encourage our little guy to keep going walking and try to look for him! This guy loved to hide in trees! Toddler’s love to know what’s going on and feel involved. If this is something new for you, it’s a great idea to get some books (I LOVE books and actually made a list of some of my favorites hiking and camping books here), or look at pictures of animals or things you might see on your walk. If possible, I sometimes give two options of which hike to do so that they feel they made the choice themselves. This might include something like “Do you want to walk through the trees to look for birds, or should we walk around the park and look for squirrels and acorns?” Of course you could adapt this kind of idea to wherever you live! If I had a dollar for every rock my son has picked up I’d be doing pretty well! 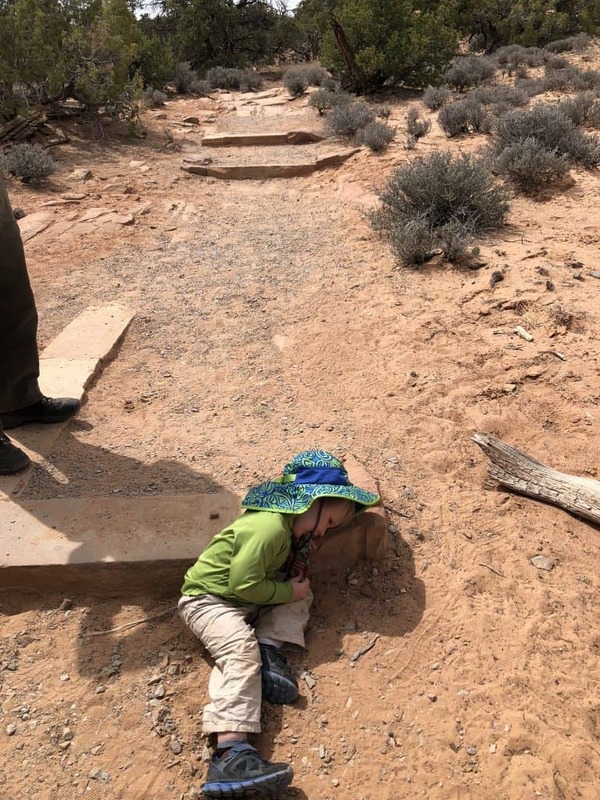 While this can sometimes back fire (Hey kid you don’t need to stop and pick up EVERY rock) it can be helpful to make an otherwise normal hike or walk fun! You can definitely use a grocery bag or anything else though. I think I care way more about that messenger bag than he does! LOL! Trial running his messenger bag before we left for our hike! Toddlers are constantly growing and snacking. This is magnified when they are using energy to go on a hike outside! No one wants a hangry toddler so be sure to bring a ton of snacks. 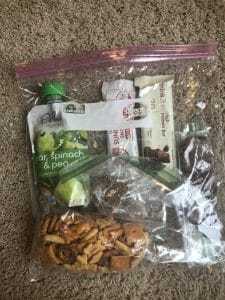 I like to include high carb ones for energy, as well as a couple sweet things (think a handful or two of coco bunnies) to spread throughout the hike. I also like to make sure the food is something easy to eat that won’t make their hand sticky or spill easily. Pouches of food are a good solution for this, as well as just a bag of snacks. My friends over at Adventuresome Sprout have some AWESOME ideas for healthy kids snacks for hiking if you need some ideas! A day of snacks laid out for our toddler. A good mix of protein, sweets, and easy to eat goods! I know we all have pretty high goals of what we want to achieve in our hikes, and they normally include a bit of distance. 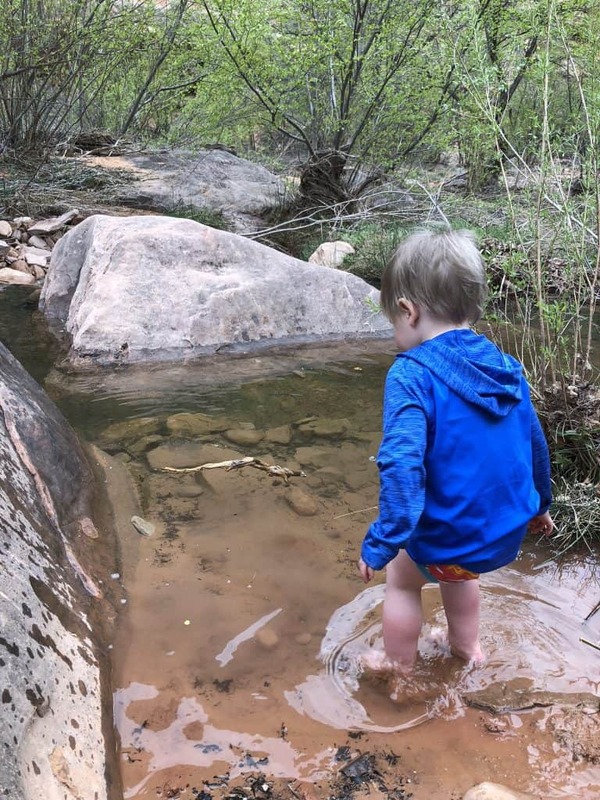 However, it’s so very important to set that aside for a couple of years to focus on growing your toddler’s love of hiking through fun, short, and easy adventures! Our little guy loves climbing rocks and anything having to do with water. So if we know we are going to try for a long hike in the morning, we plan for a fun hike in the afternoon with no goals besides to have fun. Trails with small streams they can splash in, trees to climb, or rocks to scramble are perfect for little explorers! Playing in a creek near Moab, Utah. 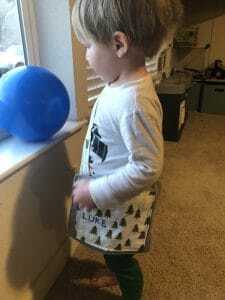 We made sure to pepper in some fun stuff along the hike for our toddler to keep him excited about getting out! If possible, I always bring a child carrier of some sort that I can use for my toddler. Though he is pretty good about walking everywhere on his own, and I do always encourage him to walk so that he can explore more, he does sometimes have off days where he just isn’t into it. We all wake up on the wrong side of the bed sometimes, and I have found this is definitely the case with toddlers! It’s super helpful to know that you can walk as far as you want without worrying about him becoming overtired, and how he will be able to walk back. 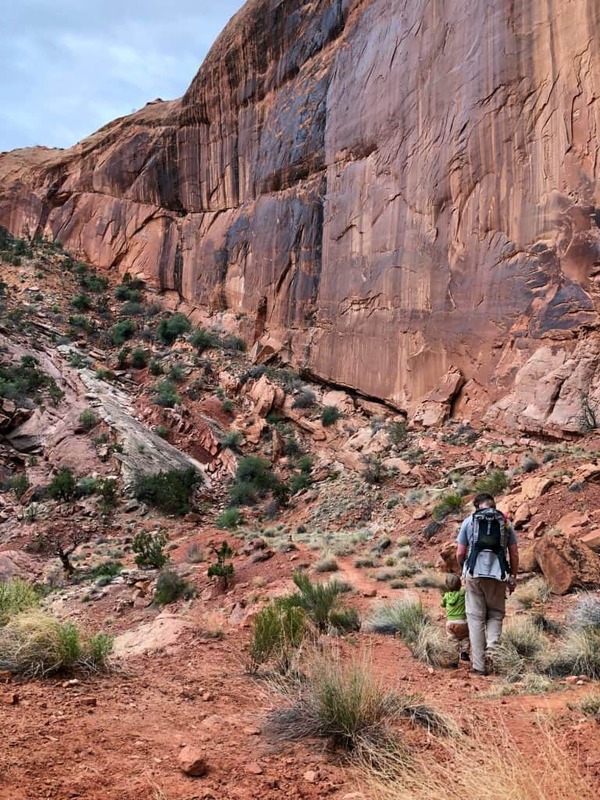 It’s also helpful to have a backup carrier if you’re hiking in a place that is WAY too cool, such as by a stream, and you need to get back to the car due to a storm or just other plans you had already made. My guy could spend hours throwing sticks into the water if I let him! I personally love the Osprey Backpacks; they are self-supporting, and super comfy for hiking! 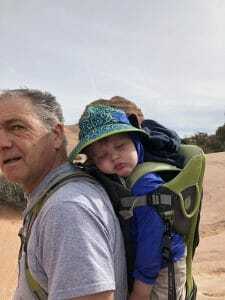 It’s seriously the best hiking backpack for babies and kids! The kid carrying backpack I love is here, as well as some other super awesome outdoor baby and toddler hiking gear! A very tired toddler after much hiking! It’s not good to run them too hard or it becomes forced and not fun anymore. Embrace the breaks, and use it to look around, talk about what you see, and appreciate being outdoors. I do sometimes have to remind myself of this, as I am someone who REALLY likes to make it to the destination. That may be the end of the trail, a certain point of interest etc..
“Sit down little bit” Be prepared for plenty of breaks. Be patient! Whether it’s in a park, national park, or just around your neighborhood, it’s so awesome you’re taking your little one out! Don’t worry if you don’t make it that far; if all else fails, at least you got some fresh air, and your toddler burned off some energy! 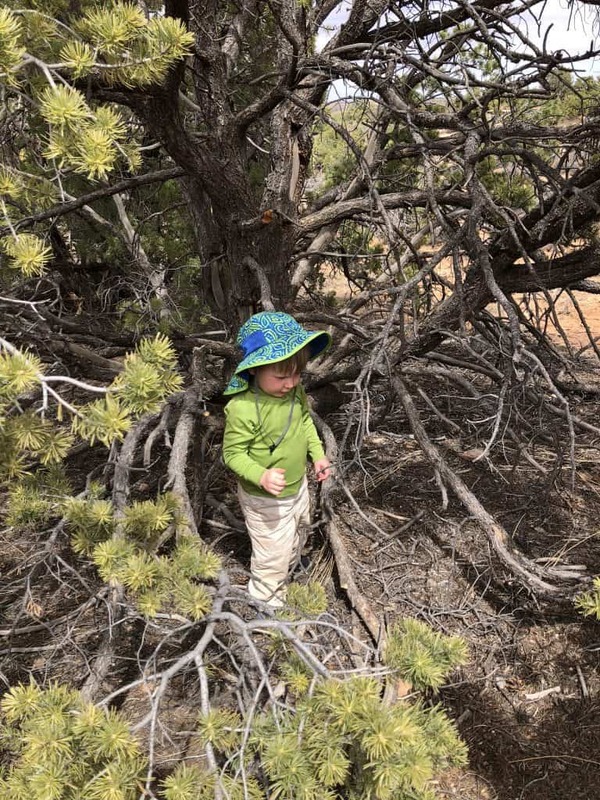 More toddler hiking tips can be found here! 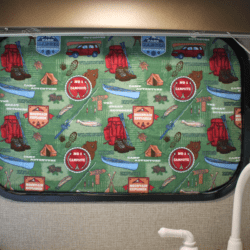 If you happen to be camping before your hike, check out my EASY sleep hack when camping with toddlers! 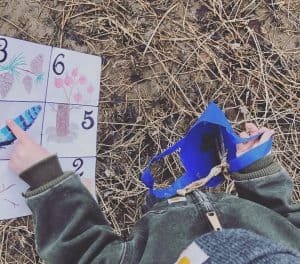 Here are 10 easy outdoor crafts to keep your toddler busy during down time! These 7 Easy Dandelion Crafts (and free printable book!) are super easy because dandelions are EVERYWHERE!